We’re excited to reveal the stats, items and abilities for three new Tier 6 Science Vessels: the Sutherland Class Research Vessel, the Naj’sov Research Vessel and the Laeosa Research Warbird. 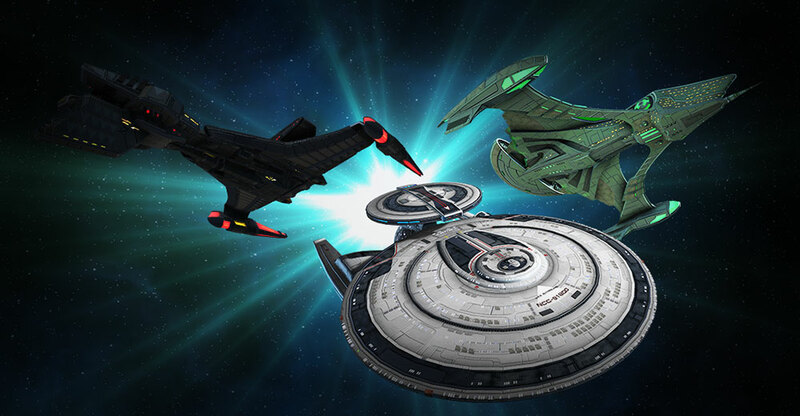 All three of these ships come equipped with a special console and can unlock a new starship trait at level 5 Starship Mastery. Below are the stats for these new Tier 6 starships and their fleet variants that will be released at the same time as the standard Tier 6 versions. A tough Federation science ship equipped with a Tachyon Particle Field Emitter, allowing it to drain enemy shields and restore the shields of allies in battle. The Sutherland is built to support fleet actions as well as stand tall on its own through the use of its tachyon-based tech. This starship features a Lieutenant Commander Engineering/Temporal Operative bridge officer station. The Tier 6 Fleet Advanced Research Vessel is based on the successful design of the Nebula Class, however it has been heavily retrofitted with state-of-the-art technology. The Tier 6 Fleet Advanced Research Vessel has been specifically designed to support your Fleet. Fleet Starships are built to the highest standard and have increased Hull Hit Points, Shield Strength and an additional Console slot. The latest science vessel from the Klingon Empire is the powerful Naj’sov-class Research Vessel. Designed for durability, it utilizes a suite of new tachyon-based tech, including the Tachyon Particle Field Emitter. This console drains the shields of enemy vessels and bolsters the shields of allied ships. The Tier 6 Fleet Naj'sov Research Vessel is an enhanced version of the standard Naj'sov Research Vessel that has been upgraded with fleet support in mind. The Tier 6 Fleet Naj'sov Research Vessel has been specifically designed to support your Fleet. Fleet Starships are built to the highest standard and have increased Hull Hit Points, Shield Strength and an additional Console slot. Republic starship designers have released their latest creation, the Laeosa-class Research Warbird. Breakthroughs in tachyon-based technology have been used to effect on this ship, including the revolutionary new Tachyon Particle Field Emitter. Use of this tech will drain enemy shields while boosting the shields of allied ships. The Tier 6 Fleet Laeosa Research Warbird is an enhanced version of the standard Laeosa Research Warbird that has been upgraded with fleet support in mind. The Fleet Laeosa Research Warbird [T6] has been specifically designed to support your Fleet. Fleet Starships are built to the highest standard and have increased Hull Hit Points, Shield Strength and an additional Console slot. Tier 6 Fleet ships do not have a 5th Starship Mastery level and thus do not unlock a Starship Trait.